The Eden Greenhouses Acorn Greenhouse is an excellent choice for those looking for a traditional shed with the additional benefits that this particular model offers. With toughened glass panes, a security fitting and plenty of space for all of your gardening projects, the Acorn Greenhouse is a fantastic all-rounder. 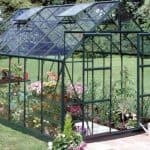 This greenhouse is excellent as a choice for the first time and is a great size built with strength. It has a single door and a silver trimmed aluminum frame with toughened glass panes and is perfect for cultivating plants, flowers and vegetables. The door is lockable for extra security and it comes with a 12 year frame guarantee. A handy little greenhouse which is easy on the pocket. If you have a smaller garden and think that there isn’t room for a greenhouse, think again as the Acorn greenhouse’s 6×10’ size allows gardening projects to flourish in even the smallest garden or exterior space. Grow flowers, plants and vegetables in the spacious interior whilst freestanding shelving allows you to increase space for your gardening projects even further. The floor to ceiling glass structure allows you to view your latest projects with pride from anywhere within your garden. The toughened glass and lockable door will keep all its contents safe and secure. 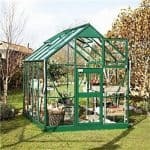 The Eden Greenhouses Acorn Greenhouse would suit a variety of gardens and projects. 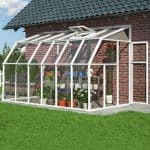 If you are a gardening enthusiast dreaming of your own greenhouse but having difficulty deciding on the right model for you, we’re here to help. In this section, the team at whatshed.co.uk take a more detailed look at its many features, hopefully helping you along the way in making an informed decision for your greenhouse purchase. Exterior: With floor to ceiling toughened glass supported by a strong aluminum frame, the greenhouse exterior is a force to be reckoned with. You will have 360 degree views both out to your garden and inwards to your gardening projects. Interior: The 6x10ft interior allows enough space for all your gardening projects, flowers, plants and vegetables. Freestanding shelving may be added to accommodate extra levels of pots and trays, allowing you to organise your projects as you go. Door: The door opens in two parts, similar to a stable door, allowing you to open the top part like a window enabling fresh air to circulate on a warm day in the garden. Security: The door is lockable for extra security for any expensive tools you may store inside. Eden Greenhouses Acorn with Toughened Glass Greenhouse: How easy to build? 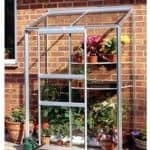 The Acorn Greenhouse is constructed from floor to ceiling toughened glass; as such it is highly recommended that two people work on assembling the greenhouse together. The greenhouse package will contain all of the glass panels, aluminum framing, fixtures and fittings that are required for assembly. All that you will be required to provide is a basic set of tools. A complete set of instructions will be provided, comprising of easy-to-read and follow instructions and diagrams. We expect that the greenhouse could be assembled within a day, however those more experienced DIY hands may have it put together a lot quicker than this. Eden Greenhouses Acorn with Toughened Glass Greenhouse: What is the overall quality like? The Acorn Greenhouse with toughened glass is just one of the many options and products within the Eden Greenhouses range. 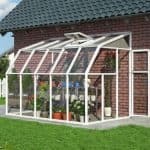 However, if you are looking for a highly secure and solid greenhouse which will be enjoyed within your garden for many years to come, this could be the model for you. With an aluminium frame, 3mm toughened glass and a 12 year frame guarantee you can rest safe in the knowledge that you are getting a solid piece of equipment. Although a base is an optional extra, it is a highly recommended add-on as the galvanised steel base will anchor your greenhouse firmly to the ground as well as providing an extra 12cm in height. The Eden Greehouses Acorn Greenhouse could be the right greenhouse for you if you are specifically looking for one with toughened glass to protect your plants and tools from both the elements and intruders. 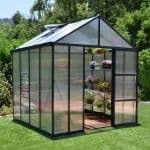 At this mid-range price point, you are getting a traditional greenhouse with the modern styling and practicality of an aluminum frame. 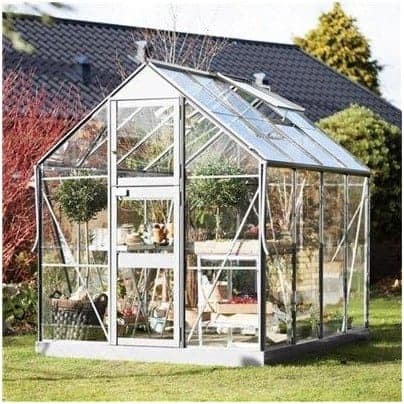 Stop dreaming and start putting all of those gardening projects into action with this fantastic greenhouse today. This is the greenhouse that I bought through here along with the pergola that I bought through this site as well. I raise orchids and that is needless to say, a challenge. The size for this type of thing is actually more than ample and I could have done with the conservatory style smaller one but i wanted enough space to store all my little supplies for what I do. I also wanted space to throw in a few tomato plants as well. So, for the price an function I say great value for money.